Don’t forget to check out our Facebook for up to date news about Habitat! We have a Big Game Party, houses being finished, and our fearless leader CEO Jack Wilson has been with us for 4 years! Check us out by clicking the link below. 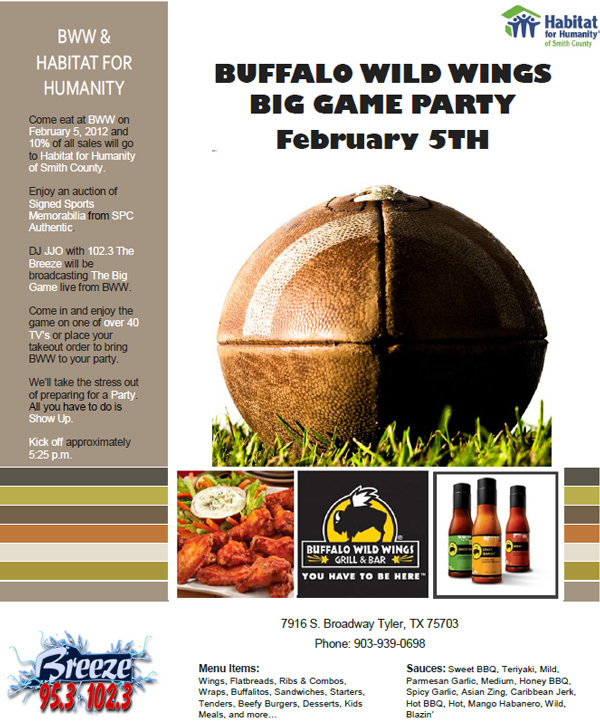 This entry was posted in Uncategorized and tagged Big Game Party, Buffalo Wild Wings, Facebook, Updates on January 25, 2012 by Smith County Habitat. This entry was posted in Uncategorized and tagged Buffalo Wild Wings, Games, Habitat for Humanity of Smith County, JJO, Party, Prizes, SPC Authentic, Super Bowl, The Breeze, Updates on December 13, 2011 by Smith County Habitat. Naval Academy Organist Monte Maxwell has arrived and is ready to blow you away with his rendition of our all time favorite Christmas music! Concert is on November 17th at the First Presbyterian Church ( 230 W. Rusk, Tyler, TX). Call 903.595.6630 to reserve your seat today! This entry was posted in Uncategorized and tagged Habitat for Humanity of Smith County, monte maxwell, Reserve Tickets, united states naval academy, Updates on November 15, 2011 by Smith County Habitat. This entry was posted in Uncategorized and tagged Heroes and Hope Concert, Updates on November 1, 2011 by Smith County Habitat. We have a new Community Cornerstone! This entry was posted in Uncategorized and tagged Community Cornerstone, TaylorMade Design, Updates, Web Designs on October 11, 2011 by Smith County Habitat. This entry was posted in Uncategorized and tagged Concert, Cruise, More Information, Newsletter, Updates, World Habitat Day, www.smithcountyhabitat.org on September 27, 2011 by Smith County Habitat. If you’d like to be apart of any of these events, please call 903.595.6630 or for more information go to www.smithcountyhabitat.org . This entry was posted in Uncategorized and tagged Cruise, Heroes, Heroes and Hope Concert, Hope, Newsletter, Updates on August 23, 2011 by Smith County Habitat.